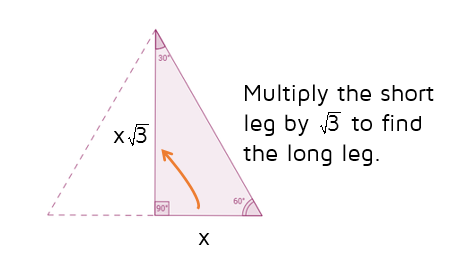 The long leg is the same as the short leg times the square root of 3. This relationship is true of every 30-60-90 triangle. So from now on, don't use the Pythagorean Theorem. Use the shortcut. If you know the short leg, just multiply it by the square root of 3 to find the long leg. 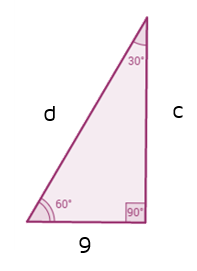 It might help to sketch out the rest of the equilateral triangle so you can visualize the relationships between the sides. Remember, the two legs form the letter L that makes the 90 degree angle. We've been given the shorter leg. 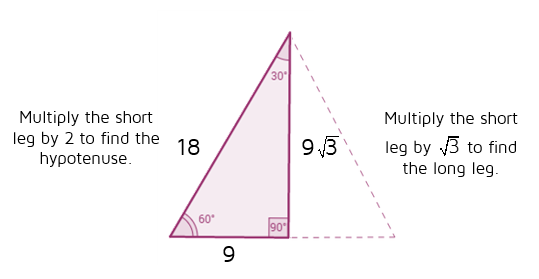 We know the hypotenuse is twice as large as the short leg. This gives us d = 18. To find the longer leg, we multiply the short let by the square root of 3. This means c = 9 times the square root of 3. 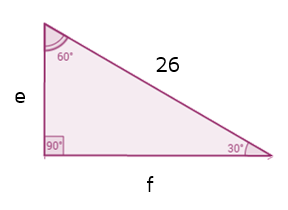 We've been given the hypotenuse of the 30-60-90 triangle. 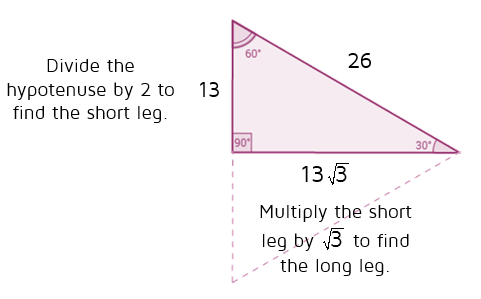 We know that the short leg is always half the length of the hypotenuse. Half of 26 is 13 so e = 13. To find the long leg, we just multiply the short leg by the square root of 3. This means f = 13 times the square root of 3.